Maintain or Lose…Up to You!! Set the alarms….Hit it hard again this week!! This week is short and sweet….not much happening around here! Our 5:15 am class is going great! Based on numbers I am only doing classes at this time on Monday, Wednesday, and Friday! I know that I am supposed to be happy about this, and I am, but I have A LOT of extra time on my hands. 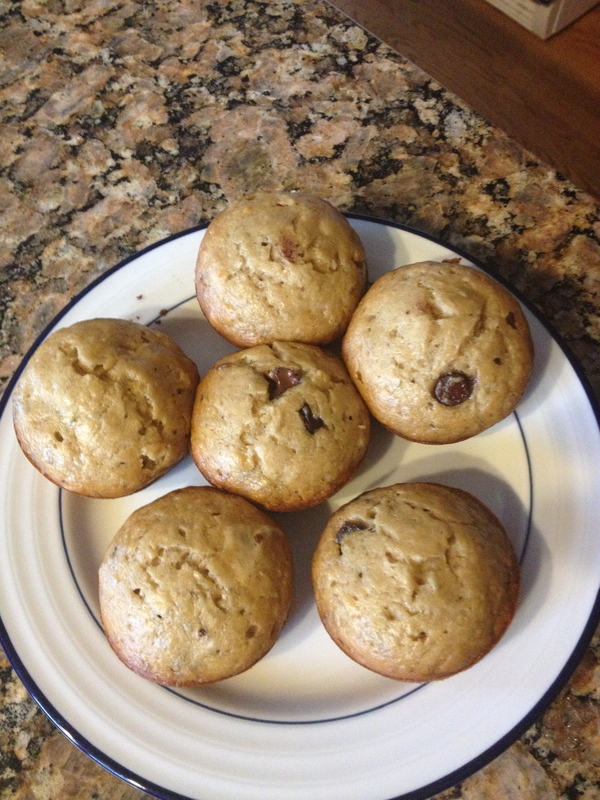 A few bonuses to more time….I’m making dinner and we are eating as a family almost every night….Bonus #1!! I also have been reading with PJ each night, he is totally into Harry Potter…we started the first book and when we finish it our prize is a dinner and ice cream date for the two of us…..Bonus #2. It’s also nice to be able to sit in the family room and watch a little tv together as a family….even if it is Doc McStuffins on the Disney Channel…..Bonus #4. I have also been able to sit and watch Becca’s Gymnastics every Tuesday and Thursday from 4-6….Bonus #5. If you can’t tell I tend to determine if my day is a good day by the number of things I have accomplished or checked off the list. I am trying to get better at that, trying to enjoy the down time. Unfortunately, I continue to fill that time with a new recipe for dinner or baked good. 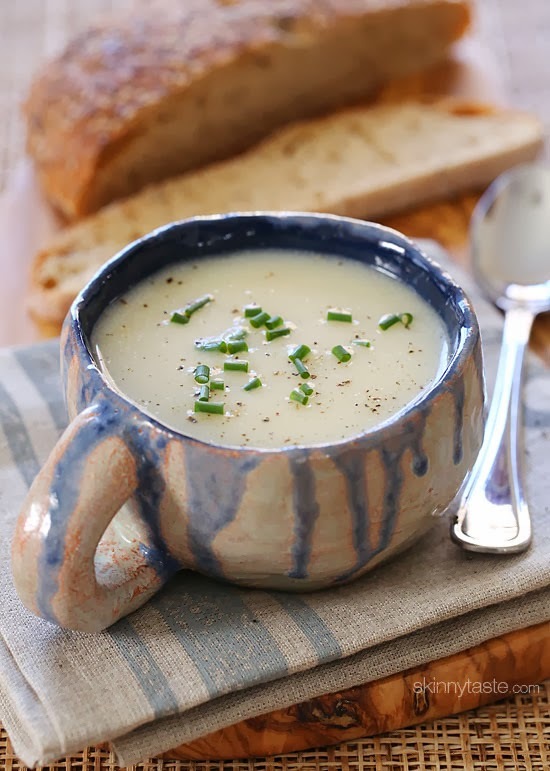 I have included some recipes I made this weekend that were a hit with the family…hopefully you get a chance to try them too. REMEMBER….IF YOU WANT 10% off next session you need to MAINTAIN YOUR BODY WEIGHT FOR THE NEXT 5 WEEKS!! As an added bonus (because I like to complicate things)…if you lose weight from your most current weigh-in weight I will take off $1 for every .5 pound you lose…so $2 for every $1.00 off the next session fee! You need to weigh in by Wednesday of this week to make it count!! In other words, I’m paying you to MAINTAIN and I’m paying you to LOSE WEIGHT TOO!! All you do is boil the cauliflower, remove from heat, and mash. 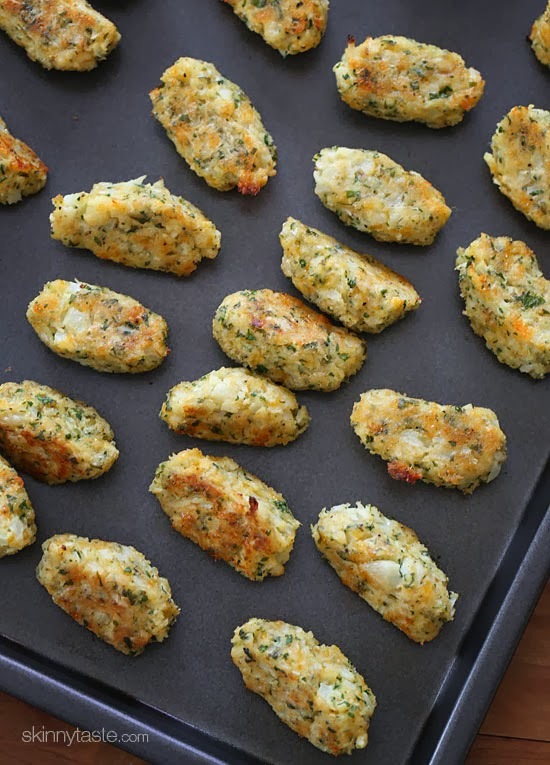 Add rest of ingredients in a bowl and make cauliflower shaped tots. I placed the tots on parchment paper and baked for about 20 minutes on one side and then flipped them to brown the other side for a few minutes. Check out the pictures…can you tell which ones were mine and which ones were from the website. LOL!! 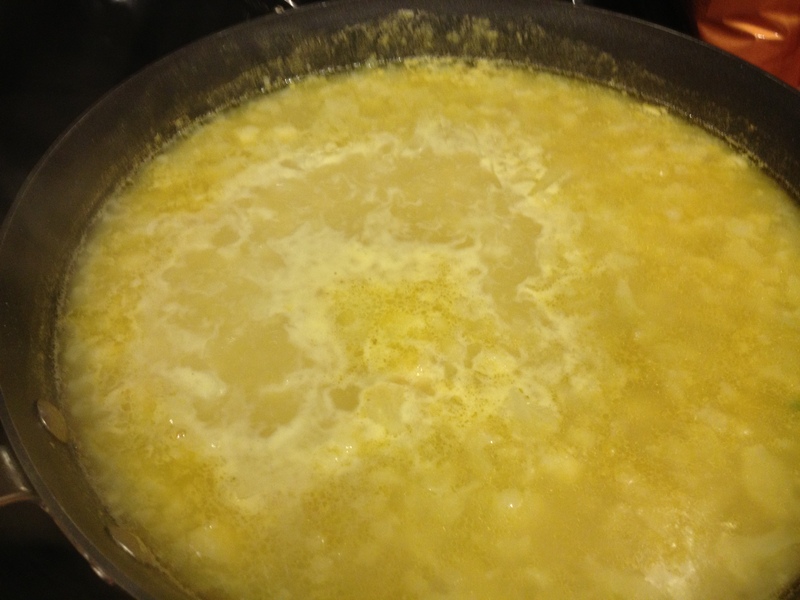 This time, melt butter…add flour….then add 4 cups of broth. 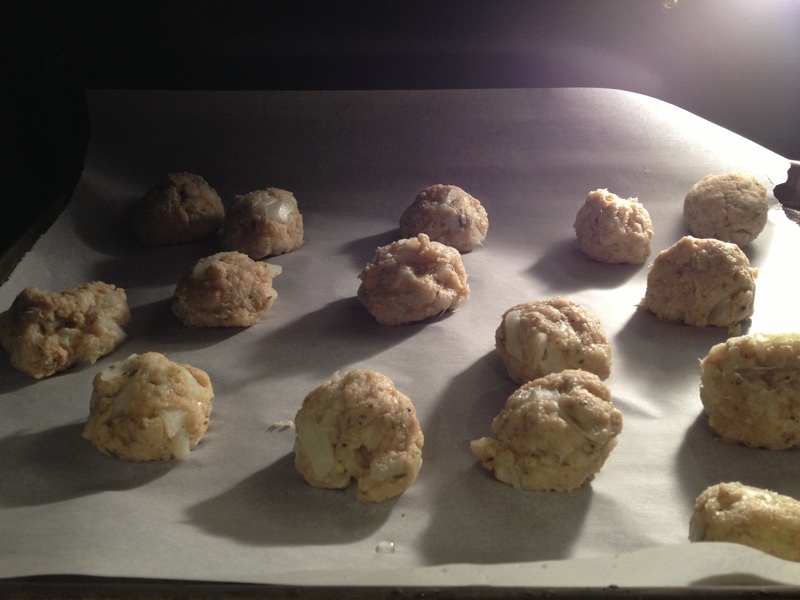 Add cauliflower and onions. Bring to boil. Let simmer for about 20 minutes. 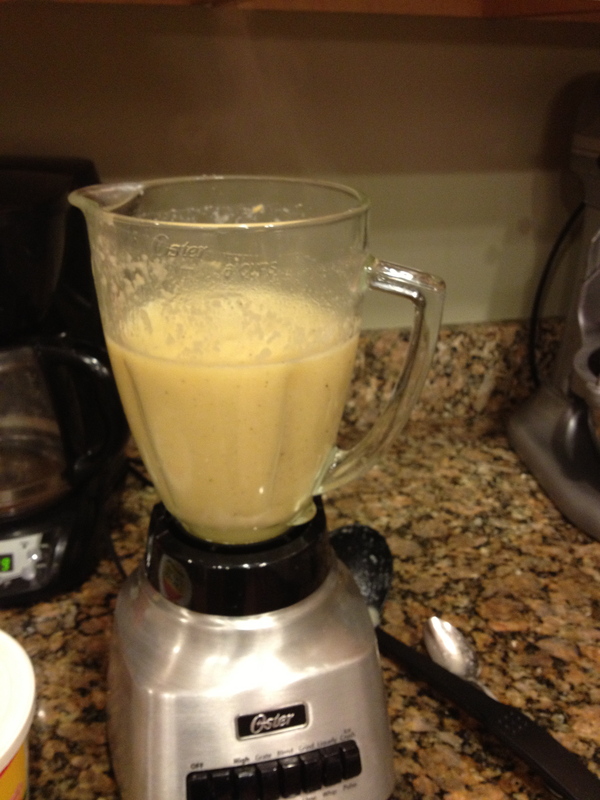 I poured the “beginning” of soup into the blender and pureed soup on low. It was perfect. Add pepper to taste. I did not add salt….I’m not a big fan of salt (the taste of it). Giving Thanks and Prayers: I’m so thankful that you guys show up every Monday, Wednesday, and Friday. I know that I would not get out of bed and workout the way I do if I didn’t have a class to come to each morning. Don’t get me wrong, I like being healthy and in shape, but I would not get out of bed at 4:48 every morning if it weren’t for all of you. Thank you. I am also thankful for my running friends that allow me to vent on our long runs and still consider me a friend after, even if shared way too much information along the course. I’m thankful for those that accept me for who I am….faults, baggage, and all!! Prayers go out to my sister and brother-in-law’s nephew in North Carolina. He is a very sick baby boy and needs all the prayers he can get. Prayers for Keegan Manz and his family as they find the right doctors and medical plan so that Keegan get better. ← NEW SESSION MONDAY! WINNERS!! HOW TO MAINTAIN!! SET THOSE ALARMS! !